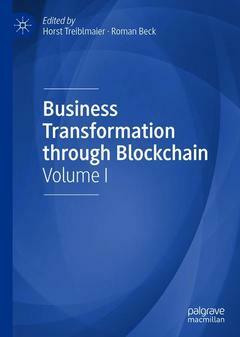 This edited collection offers a number of contributions from leading scholars investigating Blockchain and its implications for business. Focusing on the transformation of the overall value chain, the sections cover the foundations of Blockchain, its drivers and barriers, business modelling and a range of examples from industry. Using a number of theoretical and methodological approaches, this innovative publication aims to further the cause of this ground-breaking technology and its use within information technology, supply chain and wider business management research. Horst Treiblmaier is Professor and Head of the Department of International Management at MODUL University Vienna, Austria. Previously, he was a Visiting Professor at Purdue University, UCLA and UBC. His work has appeared in journals such as Information Systems Journal, Structural Equation Modeling, Journal of Business Economics, Information & Management, Communications of the AIS, Journal of Electronic Commerce Research, Schmalenbach Business Review and DATABASE for Advances in Information Systems. He serves as an AE at AIS Transactions on Human-Computer Interaction. His research interests include Blockchain, gamification, Physical Internet, e-commerce and methodological issues in social science research. Roman Beck is Professor of IT Management and Leadership at the IT University of Copenhagen, Denmark. His research spans the area of Information Systems, focusing on Services Science, IT Leadership and e-finance, including business processes, innovative information and communication systems. He has published in international journals such as MIS Quarterly, Journal of Information Technology and Electronic Markets, and contributed to a number of international conferences in the area of Information Systems.